Helen Kowalska belonged to a poor family in Poland. After years of pleading with her family, she joined the Sisters of Our Lady of Mercy and took the name Marie Faustina, which means “fortunate one.” She couldn't have imagined how fortunate she would be. With only a few years of education, her jobs in the convent consisted of cooking, cleaning, and gardening. Her simple life seemed insignificant, but she held a marvelous secret within her. Jesus charged her with instituting the devotion of the Divine Mercy. He called her His “secretary of mercy” and appeared to her and gave specific instructions to help people take advantage of this wonderful gift. He wants us to dive into the boundless ocean of His Mercy and then pass it on by becoming merciful ourselves. Trust in this Divine gift helps us realize that no sin is too great to be wiped away, therefore there is hope for everyone. Jesus asked Faustina to have a painting done of Him as He appeared to her. A priest she confided in helped her hire an artist to create the image. When the painting was finished, she lamented to Jesus that the painting didn't even compare to His majesty. He comforted her, and told her the actual painting didn't matter, only the graces He infused into it. It was only meant to be a vessel for people to fill at His fountain of mercy. After all, Jesus can work with very little - He is the One who changed water into wine and fed five thousand people with three loaves and two fish. Over a hundred million Catholics practice the Divine Mercy devotion, which came to us through a simple, poor, uneducated sister. Why, then couldn't each one of us become a vessel for His endless mercy? Just open your heart, let His mercy overflow and a fallen creation can become a masterpiece. Her feast day is October 5. Saint Sister Faustina Kowalska, the world-renowned apostle of Divine Mercy and one of the greatest mystics of the Church, was born on August 25, 1905 in Głogowiec (Łódź region). She was the third of ten children, in a poor Catholic peasant family. At her baptism, in the nearby parish church of Świnice Warckie, she was given the name Helena. During her childhood she distinguished herself by acts of devotion, her love for prayer, hard work, obedience and a tremendous sensitivity to human misery. Despite completing only three years of schooling, in her Diary she clearly described what she wanted to achieve, in a simple, precise manner, without any ambiguity. At the age of sixteen she left her family home for the nearby city of Aleksandrów and then moved to Łódź, where she worked as a servant to support herself and to help her parents. During this period the desire to join a convent was gradually growing inside her. Since her parents were against it, young Helena tried to deaden God’s call. “Once I was at a dance with one of my sisters and while everybody was having a good time, my soul was experiencing internal torments. As I began to dance, I suddenly saw Jesus at my side, Jesus racked with pain, stripped of his clothing, covered with wounds, who spoke these words to me, “How long shall I suffer and how long will you keep deceiving Me?” At that moment the charming music stopped and any company vanished from my sight; there remained Jesus and I. I took a seat by my dear sister, pretending to have a headache to hide what had taken place in my soul. After a while, I slipped out unnoticed, leaving my sister and all my companions behind, and made my way to the Cathedral of Saint Stanislaus Kostka (Łódź). It was almost twilight; there were only a few people in the cathedral. Paying no attention to what was happening around me, I fell prostrate before the Blessed Sacrament and begged the Lord to be good enough to allow me to understand what I should do next. Then I heard these words, “Go at once to Warsaw (Poland), you will enter a convent there”. I rose from prayer, came home and took care of things that needed to be settled. As best I could, I confided to my sister what took place within my soul. I told her to say goodbye to our parents and thus, in one dress, with no other belongings, I arrived in Warsaw” (Diary, 9-10). In Warsaw, she knocked on numerous convents’ doors, but with no luck. Finally, on August 1, 1925, she applied to the Congregation of the Sisters of Our Lady of Mercy, located at Żytnia Street in Warsaw, and she was accepted. Before that though, to satisfy the conditions and put together her outfit, she worked as a housekeeper near Warsaw for a family with several children. Upon joining the Congregation, Helena took on the name Sister Mary Faustina. She completed her probation in Cracow where, in the presence of Bishop Stanislaus Rospond, she took her initial religious vows, and five years later, perpetual vows professing chastity, poverty and obedience. She was assigned to work in various houses of the Congregation, spending the longest periods of time in Cracow, Płock and Vilnius, working as a cook, gardener and doorkeeper. Her extraordinarily rich mystical life was not visible to others in the convents or outside. She passionately fulfilled her duties and faithfully observed all the monastic rules. She was focused and silent, but at the same time, natural and cheerful full of a kind and unselfish love for her neighbors. Her rigorous lifestyle and exhausting fasting, which she was undertaking even before joining the Congregation, weakened her body to such an extent that already during her postulantship it became necessary to send her for medical treatment. After her first year in novitiate, she went through an unusually painful mystic experience: her so-called “dark night”, and then, further spiritual and moral sufferings related to fulfilling the mission she was given by Lord Jesus. Sister Faustina sacrificed her life for sinners to save their souls; for that she underwent a diverse range of sufferings. During the final years of her life, her health deteriorated significantly: she developed tuberculosis which attacked her lungs and gastrointestinal tract. As a result, she underwent two periods of hospital treatment, each lasting a few months. 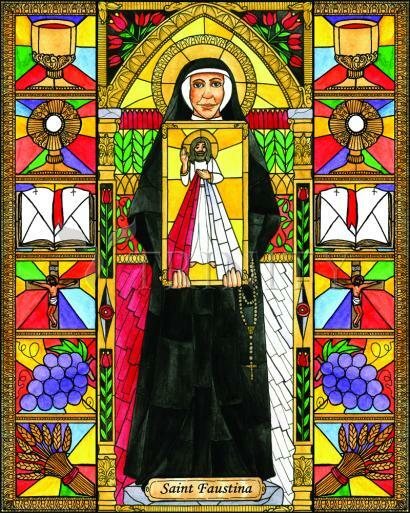 On April 30, 2000, Pope John Paul II canonized the apostle of Divine Mercy - Sister Faustina Kowalska. The canonization ceremony took place at the Vatican, on the second Sunday of Easter, the Sunday that was instituted by the Pope as the Feast of Divine Mercy for the entire Church.